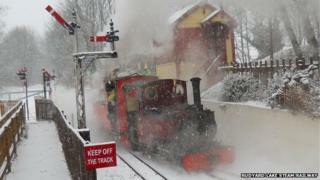 A miniature steam railway in Staffordshire, including a mile-and-a-half of track, six steam engines, four diesels, 13 carriages, a footbridge, two signal boxes and three stations, has gone up for sale. The Rudyard Lake Steam Railway, which is owned by Mike and Eileen Hanson, has an asking price of £349,950. Mr Hanson, who is selling because he "wants some time to himself", described the line as "the ultimate train set". The line attracts 40,000 people a year. Mr Hanson said: "We have had the railway since 2000 and have come to the point where it's time to do something else." He said he had been working in an office as an accountant when the opportunity came along to buy the track. "I've been into trains all my life and we put a silly offer in," he said. "Since then we have probably invested hundreds of thousands of pounds in it. It's the ultimate train set. "We have built the station and the café and added all the engines and carriages." The railway, which also includes a cafe, wagons and engine sheds, is run by a small number of part-time staff and a group of about 25 volunteers. "It's the full kit," said Mr Hanson. "But it's not the sort of thing you're going to do to make a lot of money. "I hope we find a buyer who's a bit like me - an enthusiast who wants to make it work. "